Yet another direction for Hyundai? Hyundai's recent product launches and concept vehicles have targeted two distinct buyer groups. The Veloster sport coupe and Curb compact crossover concept revealed at the Detroit auto show are clear shots at Generation Y. Upscale sedans such as the Genesis and Equus show Hyundai can play in higher-priced segments, too. Mike O'Brien, Hyundai's vice president of product planning, says upcoming products will take aim at yet another buyer group -- families. "When we think about moving forward with our product lineup, our focus is going to be more on families," O'Brien says. "Right now we feel like we can do better in terms of increasing our share of young families, but affluent families are certainly on the radar as well." Because the minivan segment is dominated by entrenched players such as the Honda Odyssey, Dodge Caravan and Toyota Sienna, expect Hyundai's next salvo to land in the crossover market. Models with more utility than sedans would be the focal point, O'Brien says, while declining to identify specific vehicles. 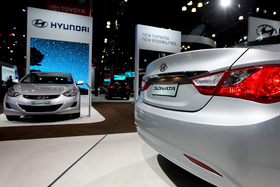 Hyundai's recent product introductions have focused primarily on its cars such as the redesigned Sonata mid-sized sedan and Elantra compact on display at the New York auto show. Hyundai's recent product introductions have focused primarily on its cars, as with the redesigned Sonata mid-sized sedan, Elantra compact, Equus full-sized luxury sedan and the redesigned Accent subcompact, which goes on sale next month. Some of its crossovers, on the other hand, need attention. The Veracruz is long in the tooth, and posting woefully low sales numbers. The Tucson, redesigned for the 2010 model year, was the last crossover to be overhauled by Hyundai. So don't be surprised if the Santa Fe -- one of Hyundai's core vehicles, which is due for a redesign late this year or next year -- marks the beginning of another new round of products from the Korean automaker.